In 1953, the Scharman family business was started by Franz B. and Patricia M. Scharman. They based their business on the saying "more people these days are buying a company's philosophy before they buy their product;" and as a result serving the community has been a forerunner and utmost goal for this family-owned business. Scharman Propane and Gas is a, full service propane and gas store featuring the finest products, technicians and services in the area. Our commitment is to deliver safe, dependable propane services and products. Our products include, fireplace inserts, gas log sets, indoor/outdoor heaters, water-heaters, grills, ranges and refrigerators. 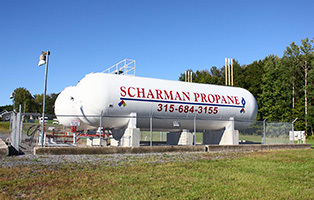 Whether you are an individual or enterprise, Scharman Propane is an industry leader that offers unmatched service and quality to our customers statewide.